Experience live music at our awe inspiring Northwoods location in Manitowish Waters, Wisconsin. 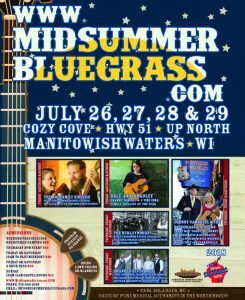 This Midsummer Bluegrass Music Festival on July 26 thru 29, 2018, will feature music by artists and bands from all over the nation. While there will be expansive opportunity for Bluegrass Aficionados to enjoy Traditional Acoustic Bluegrass, festival goers also will hear lively, innovative tunes from a number of genres including folk, blues, Texas Swing, rock, roots, Americana, acoustic jazz, Cajun and Celtic. With a wide variety of bands you’ll definitely find some new favorites! Don't forget to bring your bicycles or walking shoes. In between sets you may choose an excursion on the paved trail across the street from the festival grounds. There's 45 miles of winding trail through the beautiful Northwoods waiting for you. Visit ManitowishWaters.org for a comprehensive list of fun opportunities in the area. The Midsummer Bluegrass Music Festival is known for bringing performers that rank on the elite list of Who's Who in Bluegrass. The first Bluegrass Aficionados have arrived at this year's fest and have set up camp behind the main stage. Still there will be room for your camp!